RIVERSIDE, Mo. — Alison Walls would have been content with the assist on the game-winning goal, but when the opportunity came up late, she instinctively pounced. Park Hill’s star senior forward put the finishing touches on a historic 2-0 win Saturday, May 26 in a Class 4 quarterfinal at Park Hill District Soccer Stadium. She deftly chipped the ball over onrushing St. Teresa’s Academy freshman goalkeeper Emma Bessenbacher in the 69th minute for the Trojans’ second goal. Denied three times before in the same round, Walls couldn’t help but savor the moment, assuring Park Hill (20-3) of its second ever trip to the state semifinals and first since placing fourth in Class 2A in 1994. 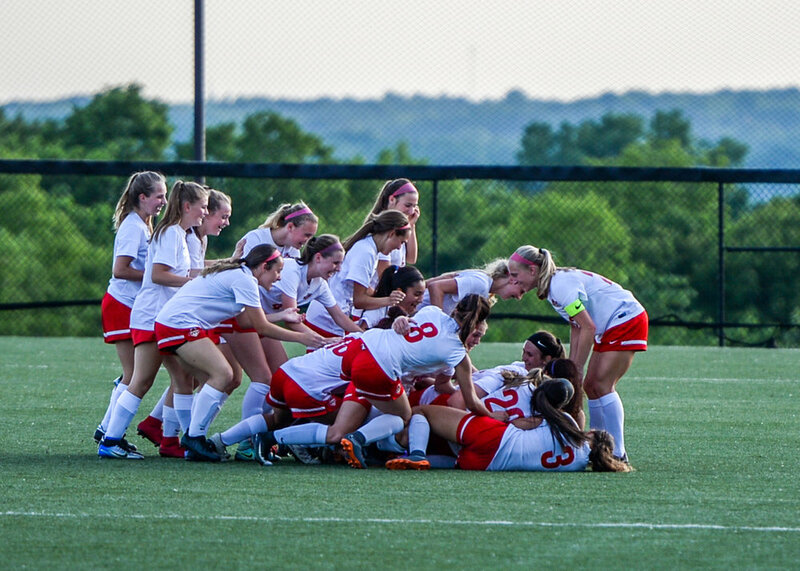 The Park Hill girls soccer team celebrates after picking up a victory against St. Teresa’s Academy in a Class 4 quarterfinal game on Saturday, May 26 at the Park Hill District Soccer Complex in Riverside, Mo. Park Hill improved to 2-7 against St. Teresa’s during matchups the past four seasons. Both wins came by identical 2-0 scores this season. St. Teresa’s seven-match winning streak in the series included a pair of quarterfinal victories over the Trojans in 2015 and 2016. Park Hill’s season ended in the same playoff round each of the past three seasons, all in shutout losses. This time around, a creative play from Walls helped spring speedy sophomore reserve Alyssa Ramos for a goal in the 15th minute for a 1-0 lead that held for most of the remainder. Walls then broke her quarterfinal scoreless drought late in the second half, finally making the experienced Stars pay for a series of bad giveaways while trying to quickly press up for an equalizer. Walls and senior goalkeeper Kelbey Emerson are the only seniors to have played in all of Park Hill’s postseason matches over the past four seasons. They now lead the Trojans into a state semifinal against Jackson (19-4) at 6 p.m. Friday, June 1 at Swope Soccer Village in Kansas City, Mo. With playoff disappointment an unfortunate part of recent history, Park Hill needed an early boost of confidence. Walls nearly offered the early lead in the 13th minute when freshman Avery Mertz set her up for a left-footed shot from 16 yards out. The effort pinged off the right post and agonizingly rolled across the face of the goal before being cleared away. That started a frenetic back-and-forth series of plays. Park Hill took a corner kick, which led to a St. Teresa’s counter attack. The move ended with Stars junior midfielder Lily Farkas rolling a shot just wide. Emerson then took the goal kick, and Walls creatively flicked the bounding ball upfield — displaying her deft ability to play with her back to the goal — to spring Ramos behind the defense. Ramos worked into the box and toe-poked a right-footed shot into the goal for a 1-0 lead, all thanks to the initial long ball from Emerson. St. Teresa’s never truly recovered, only offering up a series of half chances in the final 65 minutes. Many of those came late in the first half, and Emerson finished her second straight clean sheet with a comfortable five saves. Park Hill’s remade defense continued to shine with junior Aleece Noble and sophomore Grace Wineinger anchoring the center, sophomore Payton Watson manning the right back spot and juniors Shannon Kauffman and Morgan Young effectively rotating on the left side. Young and Wineinger earned valuable playing team in the 2017 postseason when injuries hit Noble and current Notre Dame defender Jenna Winebrenner ahead of a Class 4 quarterfinal loss to Lee’s Summit North. Park Hill continued to push for a second goal with sophomore midfielder Dragana Andnovski just missing on a pair of long-range chances on either side of halftime. In the 28th minute, a hopeful shot from 34 yards out forced a sprawling save from St. Teresa’s junior goalkeeper Caroline Franke, and a one-time shot from 30 yards out in the 50th minute went just high with Bessenbacher in for the second half. Walls ended up with the final chance after a St. Teresa’s turnover in the defensive third. Park Hill freshman midfielder Jordan Austin slid the ball through to Walls, who lofted the ball over the goalkeeper for a well-deserved moment. While Park Hill ascended to a top-level team over the past four seasons, many star players — Winebrenner, Bella Catano, Sam Paulak, Taylor Bucholz and many others among them — didn’t have the celebration opportunity that came 11 minutes after Walls’ goal. Many players started hugging on the field as the public address announcer counted down the final seconds of the 2-0 win. Park Hill’s first state semifinalist in more than two decades includes just four seniors: Walls, Emerson, Camryn Galvin and Emily Goldsbury. The Trojans have played the season without a returning all-state defender who graduated early and injured junior Sarah Hibbeler. Additionally, they lost versatile freshman Olivia Noble to a dislocated kneecap. Regardless of how the roster came to be, Park Hill now has two games left to make more program history after a win not just for the current group but all of those who helped push the Trojans into this position during previous seasons.